Sono Luminus presents this engaging and exciting grouping of modern works for the harpsichord that takes full advantage of all of the tonal and harmonic characteristics of this dynamic instrument. This virtousic performance is by Grammy nominated harpsichordist Jory Vinikour. This album brings a new musical spin to the instrument which is better associated with Bach, Rameau and Couperin than the rousing composers here. Towards the beginning of the 20th century, after more than a century of obscurity, the harpsichord enjoyed a conspicuous revival. 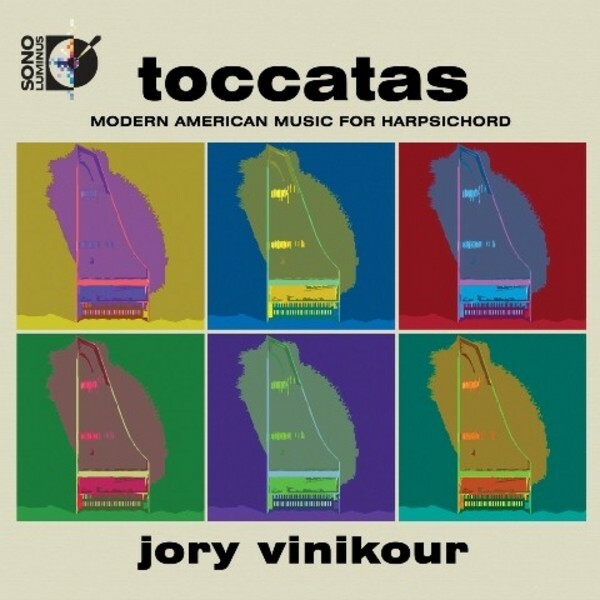 This spirit of revival continues in this latest Sono Luminus release, with many of the works on Toccatas written for Jory Vinikour himself. Jory Vinikour is recognized as one of the outstanding harpsichordists of his generation. A highly diversified career brings him to the world�s most important festivals and concert halls as recital and concerto soloist, partner to several of today�s finest singers, and as one of the most visible continuo performers. Born in Chicago, Jory Vinikour came to Paris on a scholarship from the Fulbright Foundation to study with Huguette Dreyfus and Kenneth Gilbert. First Prizes in the International Harpsichord Competitions of Warsaw (1993) and the Prague Spring Festival (1994) brought him to the public�s attention, and he has since appeared in festivals and concert series throughout much of the world.